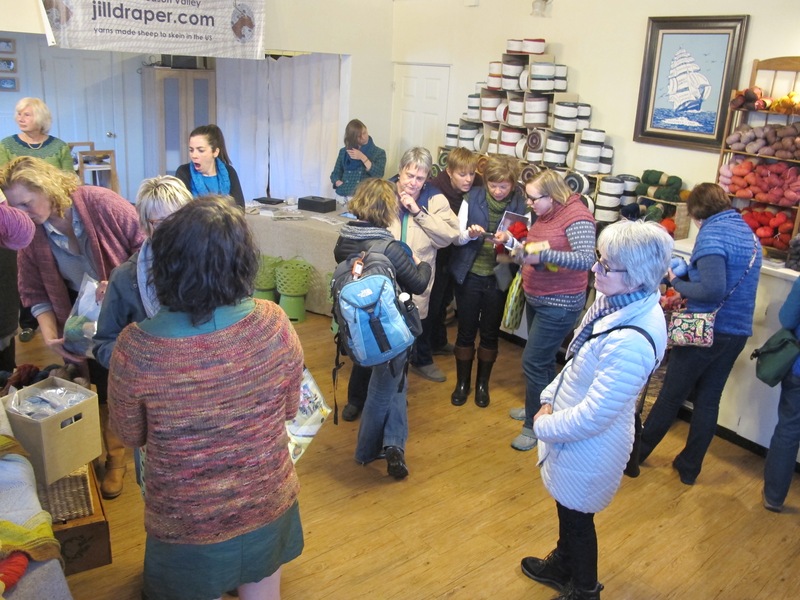 On the Saturday of Rhinebeck Jill Draper had an”open studio”. Jill Draper is the owner of Jill Draper Makes Stuff. She is a knitter, dyer and spinner who sells yarn sourced from American sheep and spun in the U.S. and dyed lovingly by her. For the past several years she has shared a booth at Rhinebeck with Jennie the Potter. As they both attract a crowd of loyal followers, sharing a booth was no longer a viable option. 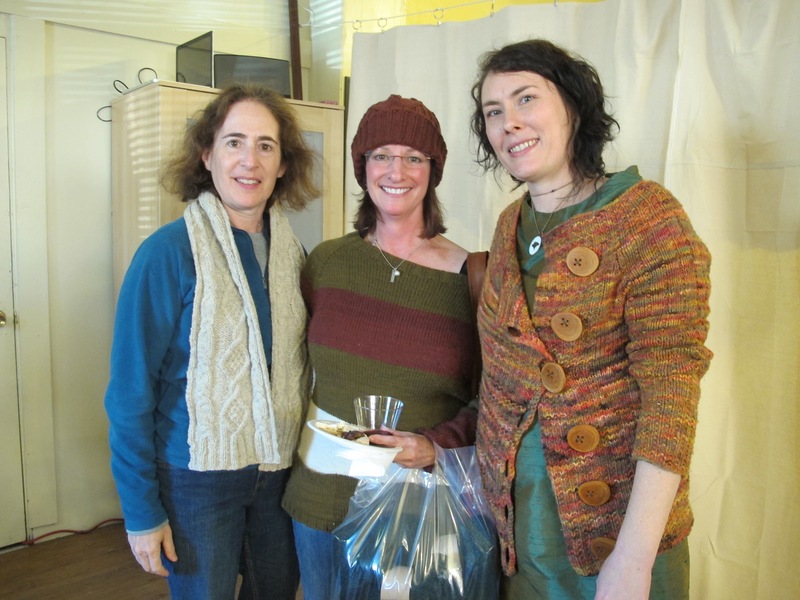 Jill recently got dedicated studio space to dye and dry her yarn, so it was the perfect time for an open house. 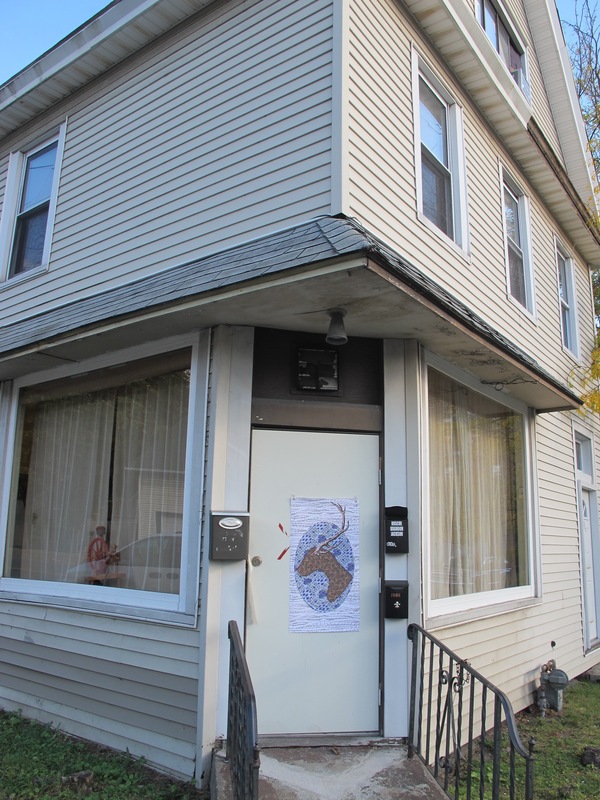 Did I mention that Jill lives in Kingston, New York, just a hop and a skip from the fairgrounds, and close to our hotel? Jill wearing one her her creations in Empire. She’s on the right. Larry and I headed over there on Saturday after our day at the fairgrounds. We were one of the first there, and thank goodness. Within thirty minutes the place was crowded, and we heard later that after another hour it was wall to wall people. We were glad for Jill that her open house was such a hit, and not really surprised. Her stuff is fabulous, and all U.S. made from sheep to skein, another plus. Before the crowds . . .
Jill’s mother was there too to help out and provide support. A lot of yarn was sold that afternoon. I picked out what I wanted right off, paid, and headed for the food table. We had some wine and cheese and crackers and other tasty treats that they had laid out at the back of the studio. I told Jill that I had just finished a cardigan out of her merino yarn Windham. I hadn’t sewn on the buttons yet, but showed it to her anyways. Yes, it is that pink! In addition to Merino yarn, Jill also sells a sport weight cormo, and an Aran weight Rambouillet that is affectionately called a yarn baby because it is sold in a huge1280 yard skein. Her newest yarn is Rifton, a skein of 600 yards that can make a scarf or shawl and changes color as you knit. It comes in four color combinations: Spring, Summer, Fall and Winter. We met some new friends there, including Steven who was wearing a handkint sweater and shorts. Love that bright orange color! He was happy to be at Jill’s and posed in front of some of her yarn. We left Jill’s tired after our long day, and eagerly awaiting more fun on Sunday. Thanks BJ! I guess not having to get up at 5 AM and commute is good for my health. I still need to find buttons for the sweater.